All of the raptors at HawkQuest are non-releasable due to either imprinting or injuries. This Bald Eagle (Haliaeetus leucocephalus) is a female born in the spring of 1999. She was received from a rehabilitation facility in the State of Washington and is an imprint. Typical length: 31 inches, typical wingspan: 80 inches. This Bald Eagle (Haliaeetus leucocephalus) is an Alaskan female born in 2005. On Christmas 2006 she arrived at Bird TLC (a rehab center in Anchorage, Alaska) after having impaled her left wing on a branch. Has damage to the patagium that does not allow her to extend her left wing fully. She was received at HawkQuest from Bird TLC in August 2007. This Bald Eagle (Haliaeetus leucocephalus) is an Alaskan female born in the spring of 2009. 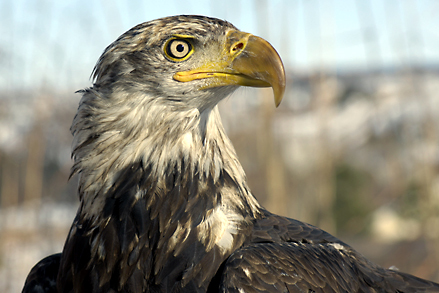 She was found with an eye injury in Kodiak NWR in March 2010 and taken to Bird TLC in Anchorage Alaska for rehabilitation. Because of the loss of sight in one eye and her young age, it was determined she was not a candidate for release. HawkQuest received this bird in November 2010. 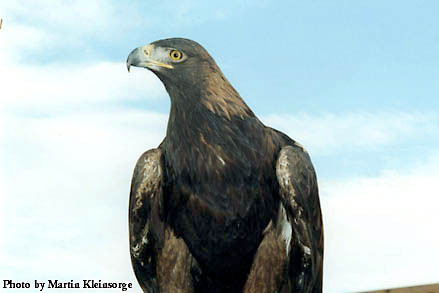 This Golden Eagle (Aquila chrysaetos) is a male born in 1988. 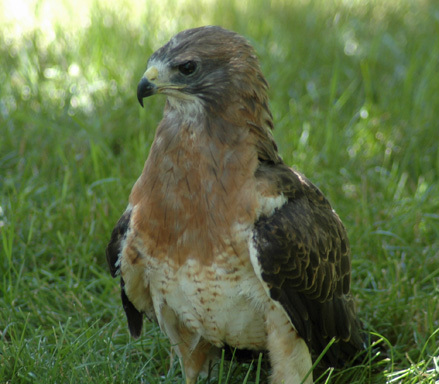 HawkQuest received him from a rehabilitation facility in Idaho. He is an imprint and, therefore, not releasable. Typical length: 30 inches, typical wingspan: 79 inches. 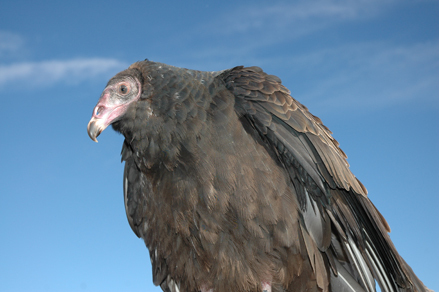 This Turkey Vulture (Cathartes aura) is a female, born in spring 2010. She was brought to Milford Nature Center in Junction City Kansas as an imprinted nestling (someone had destroyed the nest). HawkQuest received this bird from MNC in September 2010. Typical length: 27 inches, typical wingspan: 72 inches. 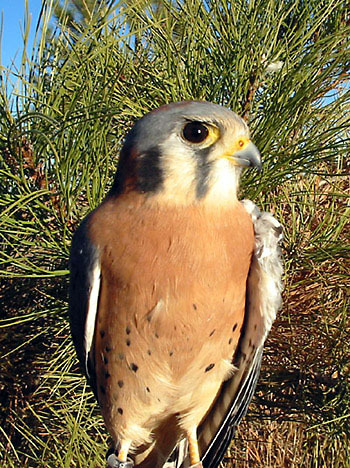 This American Kestrel (Falco sparverius) is a male that was born in the spring of 2001. He was injured and deemed non-releasable. He was received at HawkQuest from the Rocky Mountain Raptor Program (CSU)	. Typical length: 9 inches, typical wingspan: 20 inches. This American Kestrel (Falco sparverius) is a female, born in the spring of 2006. She is an imprint received from California Foundation for Birds of Prey. This male Peregrine Falcon (Falco peregrinus) was acquired in 2017 from a breeder. Typical length: 13 inches, typical wingspan: 39 inches. This female Peregrine Falcon (Falco peregrinus) was born in 2001. HawkQuest acquired her in 2014 from a breeder. Typical length: 16 inches, typical wingspan: 41 inches. 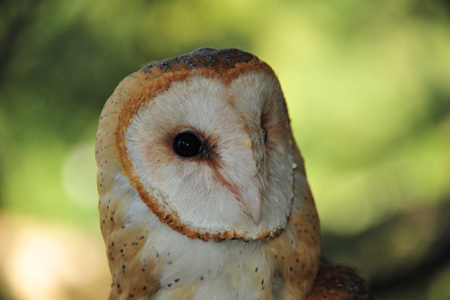 This Barn Owl (Tyto alba) is a female, hatched in captivity at the World Bird Sanctuary. She was born in February 2002. Typical length: 16 inches, typical wingspan: 42 inches. 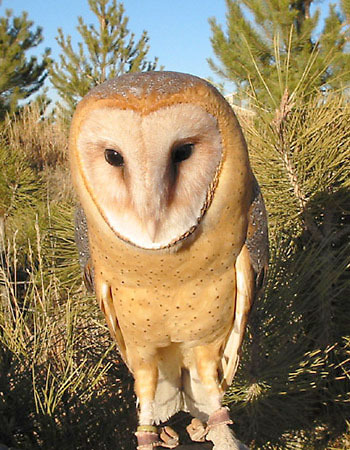 This Barn Owl (Tyto alba) is a male, age unknown. HawkQuest acquired him in 2012 from a rehab center in Albuquerque, NM. He was hit by a car resulting in a left wing injury. 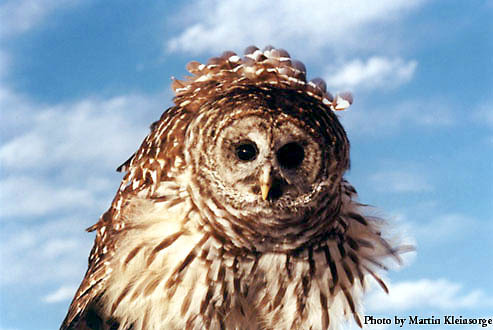 This Barred Owl (Strix varia) is a male. He was born in 2016. He came to HawkQuest from the Carolina Raptor Center. He unofrtunately is blind in one eye. Typical length: 21 inches, typical wingspan: 42 inches. 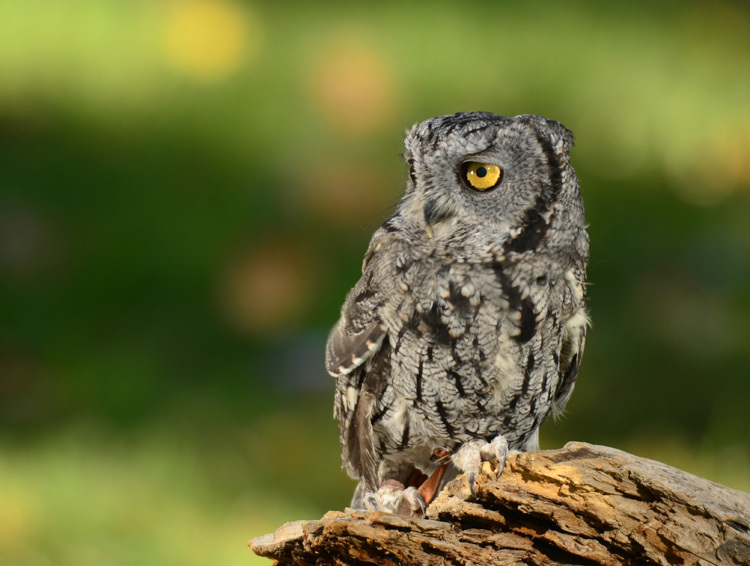 This Eastern Screech Owl, gray phase, (Megascops asio) is a female, age unknown. HawkQuest acquired her in 2012 from a rehab center in Albuquerque, NM. She has an injured right wing. Typical length: 8 inches, typical wingspan: 21 inches, typical weight: 7 oz. 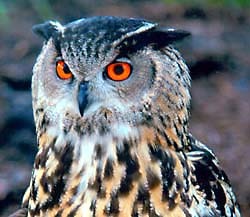 This Eurasian Eagle Owl (Bubo bubo) is a male. He was born in April of 1999 and was hatched at the Oklahoma City Zoo. Typical length: 25 inches, typical wingspan: 42 inches. This Great Horned Owl (Bubo virginianus) is a female. She was injured and has a damaged right wing. 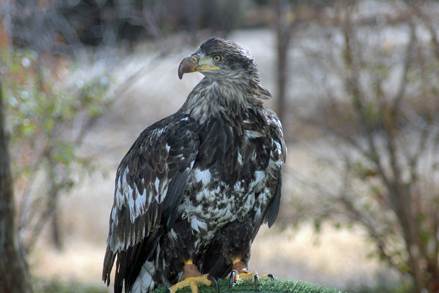 She came to HawkQuest from a rehabilitation center in Cody, Wyoming. Typical length: 22 inches, typical wingspan: 44 inches. This Great Horned Owl (Bubo virginianus) is a male. He has permanent neurological damage to his right wing from flying into a power line. He came to HawkQuest from Durango Wildlife Rehabilitation. He was born in 2002. 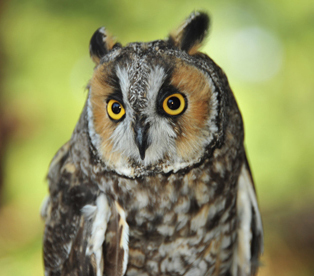 This Long-eared Owl (Asio otus) is a male, age unknown. HawkQuest acquired him in 2012 from a rehab center in Albuquerque, NM. He has an injured right wing. Typical length: 13-16 inches, typical wingspan: 36-42 inches. 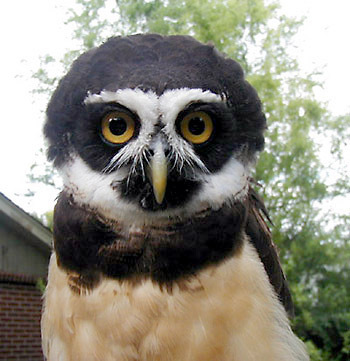 This Spectacled Owl (Pulsatrix perspicillata) is a male born in August of 2000. He was hatched at the Oklahoma City Zoo. Typical length: 18 inches, typical wingspan: 30 inches. 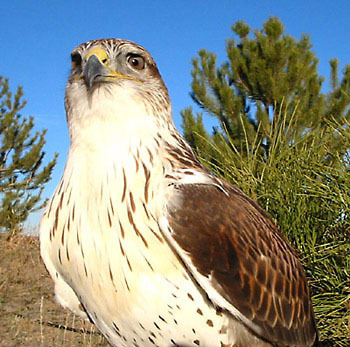 This Ferruginous Hawk (Buteo regalis) is a male that was born in April of 2002. He was hatched at the World Bird Sanctuary. Typical length: 23 inches, typical wingspan: 51 inches. 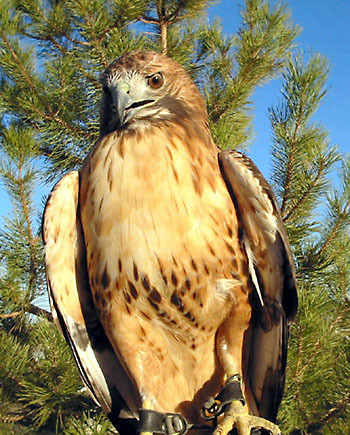 This Red-tailed Hawk (Buteo jamaicensis) is a female that was born in the spring of 2000. 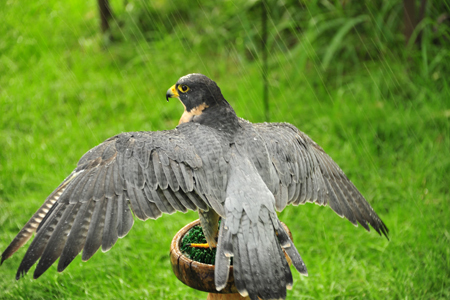 She was received at HawkQuest from a falconer. Typical length: 19 inches, typical wingspan: 49 inches. 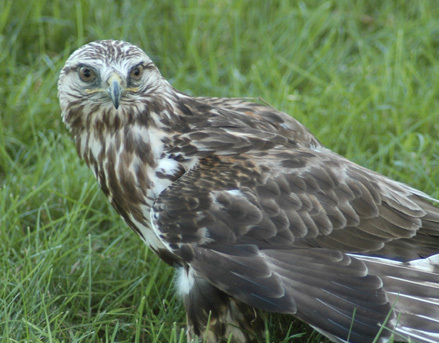 This female Rough-legged Hawk (Buteo lagopus), age unknown, was admitted to Raptor Recovery Nebraska with a broken right wing due to a gunshot. She is non-releasable due to her injuries. HawkQuest received this bird from RRN in July 2009. Typical length: 19-24 inches, typical wingspan: 48-56 inches. This male Swainson's Hawk (Buteo swainsoni), age unknown, was admitted to Raptor Recovery Nebraska with an injury to his left wing. He is non-releasable due to his injuries. HawkQuest received this bird from RRN in July 2009. Typical length: 19-22 inches, typical wingspan: 52 inches. 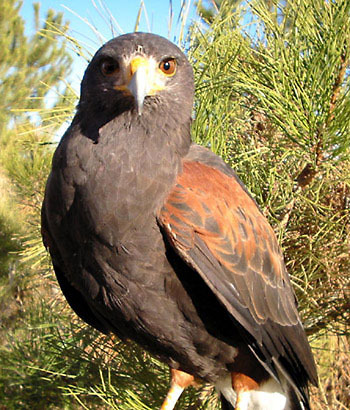 HawkQuest has 7 male and 2 female Harris' Hawks (Parabuteo unicinctus). Typical length: 20 inches, typical wingspan: 42 inches.